Some great old sage once passed the pleasant remark that "Anything worth having is worth working for, and the more desirable the object the more difficult it is of attainment." Many a young man who has started out to build a better conditioned body for himself has found the latter part of the saying to be only too true. He fully realizes that a perfect body is worth having, and he often figures that he has worked for it, but something is wrong with the work, as the progress registered is not proportionate to all his labors. Brutal as it may seem, I doubt if all have put forward the right amount of effort. Unfortunately, some believe that as long as they go through their routine, results should be obtained. Others quit too easily, and others are too impatient. They forget the amount of things that have to be taken into consideration. In the first place, thought, care, and concentration are required from the moment the first movement is made in the first exercise to the very end. Impatience is the worst thing in the world, no matter where it is concerned, and the person who is afflicted in that way is as badly off as the quitter, who never gets anywhere. The old saw that "Rome was not built in a day" is still true. Some of us are not as fortunate as others, who seem to be blessed with the magic wand of Vulcan. They build up in leaps and bounds, acquiring great ability in proportion, just as some people acquire wealth easily. Still, it would not be right to expect something without working for it, and neither is it right that a person should work so hard at his exercises that he makes the time spent seem like a torture period. Exercise is a subject that requires deep study and calls for the guiding hand of an efficient instructor. Anybody can pick up a few exercises and by practicing them keep himself normally fit, but where the developing process starts it is a different question. A few exercises picked and practiced at random are all lost motion. The beginner does not know whether the type of exercises he has scheduled for himself are of any real value or not, but the moment an expert views his measurements he can tell just what is required, and such a man should be consulted first. Some men make wonderful gains; their body seems to respond very readily to exercise, but in every case you will find that each of these men has applied himself intelligently to their routine. They never for one moment viewed exercise as a fad. With them it was considered a necessity. 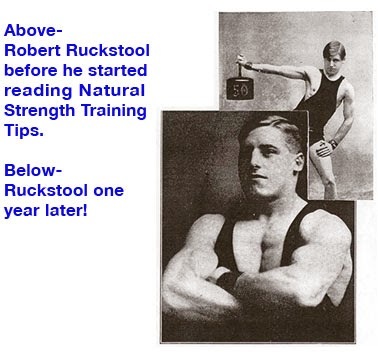 If a man starts with a bodyweight of 125 pounds, against a height of 5'9", it would be foolish for him to expect to build up into a 175-pound man within two or three months, or to compare his results with those of a man who started in at 165 pounds at the same height, and who in a very short time displayed a splendidly formed body with exceptional strength. The latter had less distance to go to win his goal. Therefore, the road must necessarily be a little longer and the going harder for the one who starts in underweight with an ill-shaped body and a lesser degree of manpower. I have known a great many who within a few weeks made fine gains on one part of their body, but the rest of their body stood still. In such a case it is not necessary to become excited, as some parts of the body will always respond more quickly to exercise than others. Therefore, before any thought of specialization is considered, at least three months should be devoted to all-round exercises. Then the exercises have been given a chance to prove their value. If it is found that the biceps or the chest have not improved in proportion, the thing to do is to change the exercises, or else specialize upon the one part of the body that you most desire to improve. 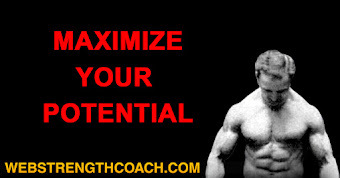 But this does not mean a body builder should begin to specialize immediately after putting in a few months' practice. He must give the body a chance, and as I just explained, a change of exercise should be given first. A great deal will also depend upon the actual condition in which the body may be. If the exerciser has a fairly well built body, he can start in to specialize earlier than it is advisable for the other fellow, who has a longer way to go. Just what I mean is something like this. Imagine two men, who are both five feet six inches tall, and one strips at 150 pounds and has a 15-inch neck, a 38-inch chest, 13-1/2 inch biceps, 22-inch thigh, and 14-1/2 inch calf, and the other fellow weighs 125 pounds stripped, with a 13-1/2 inch neck, 35-inch chest, 12-inch upper arm, 19-inch thigh and a 13-inch calf. The former is in a much getter position to commence specialized training than the other fellow, and it is always the under developed fellow who gets the most excited. Of course, we can forgive him, for we know it is only because he is very anxious to build up a body that is worth while. Yet, he should restrain himself and realize that his position is similar to that of one man who must walk twenty-five miles to accomplish the same object, for which the other man has to walk only twelve. It will take him a longer time. The smaller man should be content to follow a general routine for a longer time. Of course, it is quite justifiable for him to change certain exercises, but they should be included with the other regular exercises. When the time for specialization is reached this does not mean that all other exercises for the other parts of the body must be neglected. Training on the principle of one exercising period in each forty-eight hours, the exerciser would be required to reduce the length of time devoted to the rest of the body, so greater time can be spared for the concentration of the part of the body that is below par. Training is required every night or day, from this time on, and I might say that it is a better method to select two or three parts of the body for specialization at the same time, but with the first consideration given to the one part specially desired. Let us suppose that the chest is going to be our chief object, and we find that the biceps of the thigh are not developed to balance the general development of the thigh, and that the calf can also stand some extra attention. We find that we have three exercises for the chest that are calculated to give the results, so we concentrate on these; but do not get the idea in your head that the way to go after real chest improvement is to go the limit on each exercise, or that these three have to be practiced in rotation. The reason I selected two other parts of the body to work in conjunction with the chest was to offset that idea, because there is a right and wrong way to practice special training. It is wrong to work on an exercise until you are tired out. Suppose you find fifteen movements with a certain weight fatigues you. 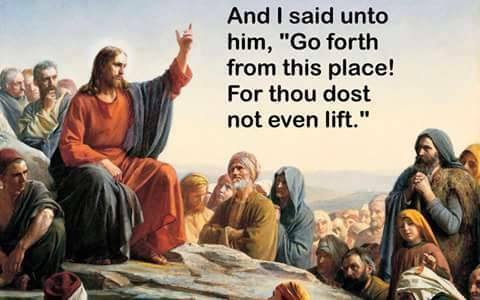 Then the thing for you to do is to go no higher than twelve counts. Commencing upon a chest exercise you use enough repetitions so that they will make you just comfortably tired. The next exercise should be for the calf; thigh biceps after that; and then come back with another chest exercise. Then, just as before, practice another exercise for one of the other parts, and every time come back with another chest exercise, to be followed by any other kind of an exercise, so long as it is not for the part of the body under consideration. The same process must be followed out if it is the neck, arms or any other group of muscles that require specialization. The first, and every other exercise, must be for the specialized part of the body. No doubt you will wonder why this procedure should be followed, so in order to make everything understandable I will explain this to you. In one of my other chapters I explained how the blood is always drawn to the center of activity. This is the natural method of repletion and absorption. Now after an exercise has been done the blood continues to circulate over the stimulated area in a greater quantity in order to reconstruct the tissue. One thing I have not explained is this. If you practice any movement until you are fatigued you will deplete your energies so that this process will not be properly performed. Fatigue is brought about by over-relaxation and contraction of the muscle fibres. They continue to contract until the nerve source is not capable of vibrating its electric life through the tissue, and this also lessens the quantity of the blood supply, and thereby deprives the muscles of their nourishing fuel. If you notice the color of the skin you will see that it has become white, just as the face of a person becomes balanced from a mental shock. That is why it is wrong to work or exercise any muscle to the stage where fatigue has set in. As I have previously stated, the natural function of the blood is to replenish, but everything has a limit, and as long as you keep within that limit, which is expressed as being comfortably tired, you can build up continuously. If you go the limit on an exercise that is all you will be able to do, and the reaction of this effort will make itself felt in the rest of the body. By cutting down well within your limit you will both build up and conserve, and while you are practicing an exercise for some other part of the body, nature is doing her work well, carrying away the broken down tissues and leaving its reserve supply for further necessity. This is why it is that by training on the plan I have explained, a body builder can keep coming back to his one center of specialization and continue to build up. As you practice in this way observe the change of the skin. It will turn a healthy pink, and you will feel the warm glow of the blood as it suffuses the muscles. In this manner I have exercised for hours at a stretch, always coming back to the one part that I was specializing upon. I never tired, but finished full of pep. 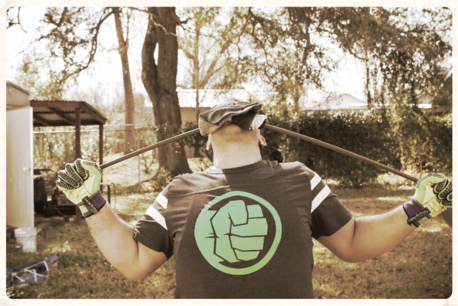 Of course, I was somewhat stronger than the average, which enabled me to stand by my practicing so long. Just the same, I was obliged to specialize upon different groups of muscles like any other body builder who had in view a well-balanced physique. The man who seems to have the most trouble is the small boned man, and the greyhound type. There appears to be an accepted belief that a man who has small bones cannot build up to any considerable size. The same belief exists with the greyhound type. They find it hard to believe that slabs of muscles can be created upon themselves to fill out their frames. I do not consider these two types as one, as the majority of people do. The greyhound type is invariably the tall, slender, hungry looking individual, who appears to have nothing hanging on his frame. Many men in this group have large bones, but the meat is missing. The small bonded man is often a neat looking individual, particularly if he is short. Of the two I find the small boned man much easier to build up than the greyhound type. But, there is no doubt that both of them find the going much harder than their more robust brothers. At that I find that the small boned man is inclined to be a little unreasonable in his demands. He allows figures to overrule certain conditions that he forgets to take into consideration. He will go to a show, and see a fine, big fellow, with a 17-inch biceps and a 46-inch chest, who sweeps him completely off his feet with admiration. Right there he wants to be built just like that man. On going home he is almost discouraged to find that his biceps measure only 12 inches and his chest around 36 inches. Still, he will plug away, and maybe get a 15-inch arm and a 40-inch chest, and finally decides there is no use for him to try any more to get that 17-inch biceps. He says it can't be done. In his desire for that 17-inch arm he does not realize that his 15-inch arm is as entirely in proportion to his weight, as the 17-inch arm of the other man. However, even getting the 17-inch arm can be done. When I commenced heavy training, after putting in years on other athletic work, I had only a 7-inch wrist, and weighed 147 pounds stripped. When I finished I weighed 200 pounds and had a 17 1/2-inch biceps and a 47-inch normal chest. Carl Moerke has an 18-inch biceps and a wrist measurement of only a little more than 7 inches. Thomas Inch, the famous English strong man, with a wrist measurement that does not measure 7 inches, developed his body to an enormous degree. His biceps became about 20 inches and chest around 50 inches. Arthur Dandurand, the Canadian Sandow, has a beautifully proportioned arm that measures 17 inches at the biceps, but his wrist is only 7 1/2 inches. In fact, I could name many such examples, where men of small bones developed their body to an extraordinary degree. As a general rule, the small boned man makes the prettiest muscular picture. Now the greyhound type is absolutely a different proposition. His muscles generally present a hungry, stringy appearance, that make a man feel he has nothing on which to build. He has the appearance of a barren filed. There is one thing I do find missing about the man with the lean muscles is the entire absence of any interstitial fat. This condition of flesh is very necessary in fertilizing the muscles. In fact, it is an ingredient of exceptional value. The work interstitial means "in between the tissues," and between the fibrous tissues of the muscles this fat secretes itself. The stronger the man, the greater quantity of interstitial fat will he have. This it is which gives his muscles that smooth, silky appearance so often seen, but not so generally understood. Therefore, the greyhound type has to find a method that will create this natural fertilizer. He has two factors to consider, diet and exercise. Ordinarily, I do not pay particular attention to diet. As long as a man is normally healthy and fit, he should allow his stomach to be his guide, but of course, not make a glutton of himself. In this case, the greyhound type should be considered an exception, and by studying the various foods he is able to provide his body with the nutriment that is converted into musculature by exercise, and the other particles not absorbed in this way are carried by the blood stream to the various parts of the body, to become secreted between the tissues, as interstitial fat. You no doubt have often head trainers speak of an athlete training until he goes stale. This is a condition brought about from too vigorous training, in which the muscles are trained raw. Just so raw that the interstitial fat has been absorbed. This causes a reaction upon the nervous system also, which makes an athlete become just "a bunch of nerves." I have noticed that many of the lean subjects develop into the type of men classified as "raw boney," and while he does not secure the exceptional measurements, yet his muscles seem to be a mass of cords. He becomes one of cordy muscle type who has as the foundation of his ability very thick ligaments. This type often displays a thickness around the joints, and the owner generally becomes exceptionally strong. Apart from a special application of diet in the case of the greyhound class, there is a triple method of specialization that can be used by the small bone type, as well as the lean type. However, this is only after they have grounded themselves for a while on a regular all-round system of body culture. The first thing we know that is desired is size, or, I might better say, space. This is absolutely necessary because as a general rule, the type of men that we are now considering are rarely broad of shoulder, deep of chest, or thick of limb, so we have to develop these conditions. To do this, we must pick out the parts of the body that are most likely to aid us. It does not take long to decide after a physical survey that the back, chest, and thighs are the three parts best suited by nature for our purpose. From now on the men who fall in these two classes must concentrate on broadening their backs, deepening heir chests, and rounding their thighs. As this is done a greater space is created on which heavier slabs of muscle can be built. The building up of these three parts will certainly help to make the bodily appearance of any man more massive. I found in many cases that it does not call for any remarkable change on the tape measure around these parts to increase the bodyweight at least ten pounds; but the supposition that these three parts of the body alone when fully developed will build up the rest of the muscles in proportion, is not true. I have seen many athletes with a fine chest who have a poor neck, and men with broad shoulders have a weak lower back. Others, with good thighs, have poor arms and calf muscles, By training on these triple parts, good abdominal and lower back development is apt to be created, along with better formed hips. 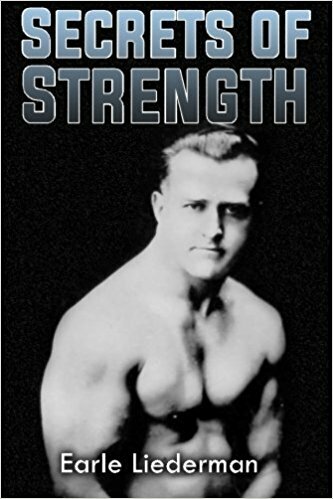 The neck, forearms, biceps, deltoids and calves will not be developed in proportion, and specialization, as I explained earlier in this chapter, will be found necessary. I cannot understand why anyone should become worried because they have only a small wrist. The man who has a big hand is likely to have a large wrist. If a man had a large hand and only a small wrist it would be very different, as the difference would be disproportionate. Just the same, the man with the big wrist has to build up his arm in proportion to the bony structure he possesses. Anyhow, why worry over what the other fellow has? You have a fixed object in your mind that you want to build up certain proportions, so concentrate upon the subject. Don't get the idea in your head that because you have a weight in your hands it alone will give you the results if you simply go through a number of repetitions in a certain position. It has been explained long ago that the mind moves the mass. The thousands of nerve centers in the body that are directed by the brain control the activity of the whole muscular system, and mentally, your movements can be registered as fixed determination or arrant listlessness. The first gives power, the second lacks power. Whenever you concentrate your mind, your nerve energies will center, and a greater resistance is evidenced. Mental concentration draws all the natural resources forward in mutual sympathy to intensify the function duties of the motive muscles. Therefore, it is readily seen what is meant when a pupil is advised to concentrate strongly upon the physical movements that form the exercise. Of course, there is no use in any of us kidding ourselves that we can all be big men with enormous proportions. That would not be logical or even desirable. Take it this way. If you stand only 5'3" and if it was possible for you to weigh 225 pounds all solid muscle, what would you look like? Nothing nice. You would only make a monstrosity of yourself. 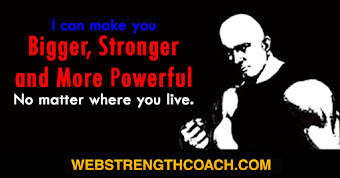 You can be equally as strong by being proportionate. I do not see what necessity there is for everyone to want to be a Gorner or a Steinbach. All well and good; if your physical possibilities throw you in their class, but talking with the fact in mind, that all cannot be two hundred pounders, we must realize the impossibility of this. Of curse, I know it would be great if we could be as good as those men by building up from a natural angle, but we cannot. Build yourself up to the best of your ability and be satisfied to be a good man in your class. Charles Schaffer was the Gorner of the 112 pound class, just the same as Marineau was the Gorner of the lightweights. If our are only 5'3" tall, and weight 150 pounds stripped, with a 15 1/2" neck, 15" biceps, 14 1/2" calf, and a 39" normal chest, you will be a pretty husky chap. Of course, there are men much heavier than that, but I am talking about a condition that is well within your reach, and which will make the man an unusually capable physical machine. When a man reaches the height of 5'6", he can scale from 175 pounds up to 200, and safely combine the dual attributes of size with strength. Such a man is dynamo of power, and his measurements can all be large and perfectly balanced. A 200-pound man of this type would have to register a 17 1/2 inch biceps, 18" neck, 47" normal chest, a 16 1/2" calf, and a 25 1/2" thigh. These measurements will give you an idea of what a man can work up to according to his class, and still remain out of the phenomena order. Look how well balanced Gorner is. His great strength is the result of highly balanced attributes. There have been many men much larger that Gorner, but not half as strong, which is a positive proof that they lacked balance somewhere. I dislike phenomenally built men; it really does not mean anything. 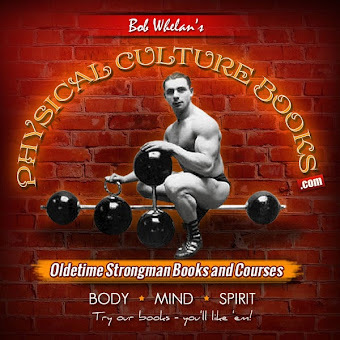 These monstrosities, with twenty-two inch biceps and calves, with sixty-inch chests, with 22" biceps and calves, with 60" chests, while standing less than 6' in height, do not come within the sphere of the body culturist, who worships a beautifully built body and vigorous strength. I have met them, but none were nearly as strong as I am, and they were unlovely to look upon. 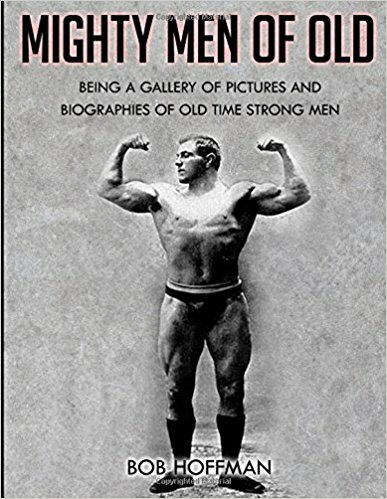 If I have to pick out the two biggest men who combined the two qualities, shape and strength, in a proper balance, I would name George Hackenschmidt and Herman Gorner as the finest combination ever produced. Size , strength, speed and physical loveliness they possessed, with registering any unusual bodyweight. 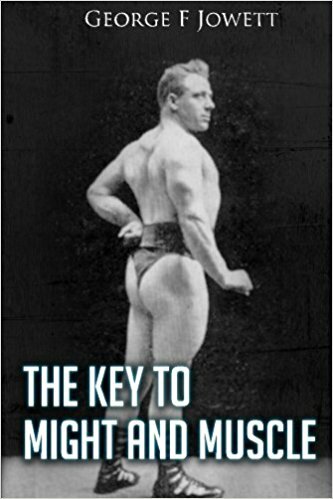 Hackenschmidt had only ordinary measurements with which to start, but right living and intelligent exercise on the bar bell principle progressive principle made his what he was, and is today. No matter if your wrist is only 6", and your weight 125 pounds, you can build yourself into a fine a specimen of manhood as any other of your own height. Height should rule more than bone size, and always bear in mind what one man has secured for himself you can get also. This may not be absolutely true, but it is true that you can come near enough to him to invite a favorable comparison.